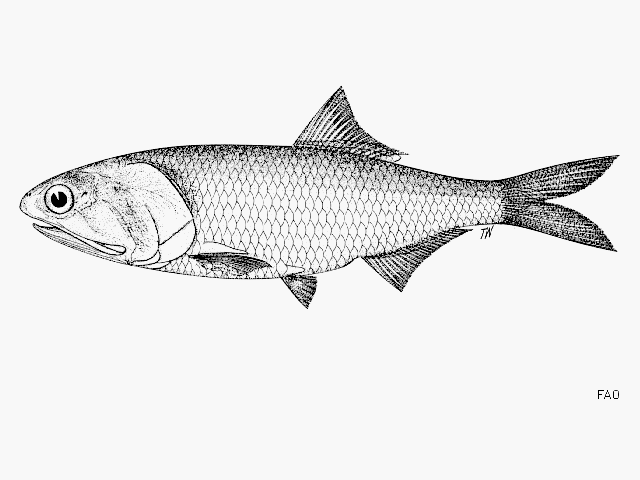 The Pacific anchoveta (Cetengraulis mysticetus) is endemic to the Eastern Pacific region, from southern California to northern Peru, being locally abundant in Panama and Nicaragua (Cotto et al. 2010) . No information regarding stock structure of Pacific anchoveta in Ecuadorian waters is available. The pacific anchoveta (locally named "chuhueco") is one of the main species captured in the multispecies small pelagic fishery and it is mainly used for reduction purposes (Prado España 2009) . Catches are above the long-term average. A six-months fishing ban is established every year to protect the reproduction of the species. Work with scientists to develop a research programme to determine the stock structure and its distribution, then implement stock assessment models that take into consideration environmental variables. Encourage regulators to develop a management plan, based on the best scientific advice, including biological reference points, a harvest strategy, and harvest control rule. Ask managers to implement measures to reduce catches of immature fish and establish appropriate limits for catch and/or effort. Work with regulators to implement a consistent system for the regular collection and publication of fisheries and observer data from all fleet segments and gear types. Develop formal decision-making frameworks, which should establish: a) sources of information and scientific research for decision making, b) consultation and inclusion of relevant stakeholders, institutions, and organizations in decision making, c) transparent reporting of research outcomes and consultation processes, and d) a public strategy to implement decisions. Encourage regulators to improve monitoring, control and surveillance to ensure compliance with regulations. The National Institute of Fisheries of Ecuador (INP) is responsible for assessing the status of the stock of all small pelagic fishes in Ecuador. However, stock assessment of Pacific anchoveta off Ecuador has not been recently conducted, and reference points have not been set. The most recent hydroacustic survey conducted in March 2018 estimated a total biomass of Pacific anchoveta off Ecuador of 189,993 tonnes corresponding to rouglhy 563 million individuals (REPORT INP). There is not historial information on the stock status or abundance apart from an old report produced by INP (Aguilar 1993) . Catches in 2016 reached 42,377 tonnes, the highest value of the series. The Law of Fisheries and Fisheries Development (Gobierno de Ecuador 1974) is the Law that regulates fishing activities in Ecuador. Management of the Fishery for Small Pelagics in Ecuador (including shortfin scad) occurring in Ecuadorian national waters is conducted by the Subsecretary of Fishery Resources which belongs to the Ministry of Aquaculture and Fisheries. A new Law of Fisheries and Aquaculture is in draft stage (July 2018). When this Law is approved, the Fishing Authority will be entity responsible for management of Ecuadorian fisheries and aquaculture activities. Pacific anchoveta in Ecuador is not managed through TACs or catch quotas and reference points for this resource have not been set. Management authorities have adopted some, but not all, of the technical measures proposed by the INP in the last years. Minimum landing sizes have not been set ignoring the high rates of juveniles in the catches repeatedly reported by INP (González 2010) (González et al. 2008) (Prado España 2009) . Management of Pacific anchoveta in Ecuador consist of temporal closures (six months from 1st January to 30th June each year) (MAGAP 2010) , spatial closures (fishing is not allowed within the first mile from the shoreline (MAP 2003) (MAP 2007) ; first eight miles from coast are reserved for artisanal fisheries; (MAP 1990) ) and a minimum mesh size of 1,5 inches for purse seiners targeting small pelagic species in Ecuador (MAGAP 2011) . Bycatch by purse seiners targeting small pelagic species in Ecuador cannot exceed 20% (MAGAP 2011) . The use of fishing lights has been prohibited in 2011 (MAGAP 2011) . A fisheries observer program is in place covering at least 30% of the fishing trips (MAGAP 2010) . There are no TAC or quotas set forthe Pacific anchoveta fishery in Ecuador. Fishing activities in Ecuadorian national waters are regulated by the Law of Fisheries and Fisheries Development (Gobierno de Ecuador 1974) , which set the penalties for violations of the regulations and acts included in that Law and which includes economic fines, withdrawal of fishing permits or imprisonment. Compliance with regulations is enforced through inspections at harbors and observers on board of commercial vessels. The new Law of Fisheries and Aquaculture which is in draft stage (July 2018) will set the new legal framework for compliance and enforcement in Ecuadorian fisheries, including a wide array of penalties such as withdrawal of fishing license, confiscation of fishing products, economic fines and immobilization of the vessel. This new Law also specifies that compliance will be enforced through VMS monitoring, on-board observers, inspection of landings, image recording systems among others. There magnitude of IUU fishing in the fishery for small pelagic species in Ecuador is unknown. Howerer, in the past it was reported some lack of compliance with the closed season of Pacific anchoveta (Prado España 2009) . There is very detailed information on seafloor types (Terán et al. 2006) off Ecuador and most priority habitats such as coral reefs or mangrove swamps have been identified and mapped by the Ministry of the Environment and made available through the Environmental Interactive Map in 2015. However, there is no information on the impacts of purse seiners targeting small pelagic species in Ecuador, on bottom habitats. Since this is a pelagic gear, it could be assumed that the impact is negligible. However in some years there are considerable catches of species such as the Pacific bumper (Chloroscombrus orqueta) or searobins (Prionotus spp.) that live close to the bottom meaning that either the purse seines are higher that legally allowed and cover the whole water column or vessels operate very close to the shoreline (Prado España 2009) . In both cases, an impact on seabed habitats might take place, but the magnitude of such an impact has not been evaluated. Alternatively demersal species may be attracted to the surface by artifical lights, although this practice is banned since 2011 (MAGAP 2011) . The pelagic ecosystem in the Eastern Tropical Pacific Ocean has been object of research and it is well described. Models have been developed in the past to describe the ecosystem dynamics, structure and functioning in relation to tuna fisheries (Olson and Watters 2003) . Pacific anchoveta is included in the group of miscellaneous epipelagic fishes which is a key element of the Eastern Pacific Pelagic ecosystem (Olson and Watters 2003), so harvesting this species may potentially disrupt the ecosystem structure and function. However there is no enough data to understand if this fishery may cause serious or irreversible harm to the whole ecosystem as the specific impact of the fishery of small pelagic fishes was not assessed in the model. Pacific anchoveta is not managed through TACs or fish quotas in Ecuador. Some but not all the management recommendations made by the National Institue of Fisheries of Ecuador (INP) have been adopted by the management entity. For instance, there is a six-months ban established every year to protect the reproduction of this species, a regulation on mesh size and some spatial protection measures have been adopted to protect reproductive phases, as advised. Minimum landing sizes, however, have not been implemented in spite of being one of the recommendations of the INP. Landings of Pacific anchoveta have increased in the last years and they are now above the long-term average, but still low compared to the high catch records in the late 1980's and 1990's. There is no information on current stock status because stock assessment has not been recently conducted. Although harvest levels have not been recognized as unsustainable, stock assessment of Pacific anchoveta in this region has never been conducted so it is not possible to know if current harvest levels are sustainable and what will be the stock health in the future. Information on total biomass and number of individuals was obtained at a recent acoustic survey along the Ecuadorian coast (REF). Cedeño, I. and González, N. 2008. Criterios técnicos para la reconsideración de las vedas vigentes de Pinchagua (Opisthonema spp) y Chuhueco (Cetengraulis mysticetus), Instituto Nacional de Pesca del Ecuador, Programa Peces Pelágicos Pequeños, 12 pp. González, N., Prado, M., Castro, R., Solano, F., Jurado, V., Peña, M. undated. Análisis de la pesquería de peces pelágicos en el Ecuador (1981-2007), Instituto Nacional de Pesca, Investigación de Recursos Bioacuáticos y su Ambiente, 40 pp.